YayforFriday! That means group lunch here at the office. We did Indian last week. Not sure what we'll do this week yet. But when this posts, assume I'm eating yummy things. Speaking of bites, we've got our regular section of bite-size stories that we present to you here. 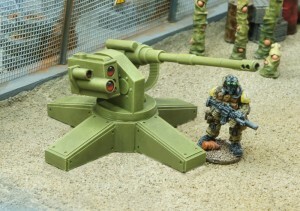 Pardulon Models adds some firepower to the table with their new gun platform, available in their webshop. We've just released a multi-part kit of an autonomous area defense system. Usable in defensive scenarios, as mission objective or simply as decorative element on any scifi or near future table. Pardulon Models has their new website up and running. Go take a look. We're proud to announce our all-new website, including new galleries, a quantity discount, and a host of features that make the shop easier to use. Especially our non-EU customers (who are exempted from the German VAT) will be pleased to hear that it is now possible to see the correct order value directly in the cart, without having to open a customer account first. 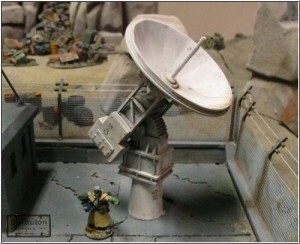 Pardulon Models knows sometimes your little mans don't want cable anymore and so have supplied them with a new satellite dish terrain piece so they can get all the premium channels. A large satellite dish has just been released. Usable in either civilian or military installations, this model will make a nice centerpiece on any table. Originally intended for 28 mm, this model can certainly be used for smaller scales as well, making for an even more impressive eyecatcher. 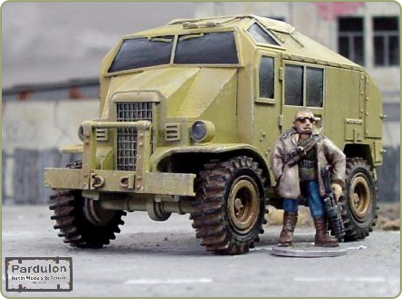 Pardulon has 3 new sets of 28mm civilian models available over in their webstore. 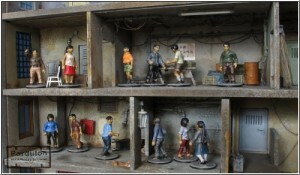 We have just released three sets of 28 mm civilians suitable for Chinese of other eastern settings. All three sets come with separate heads for a bit of variation. 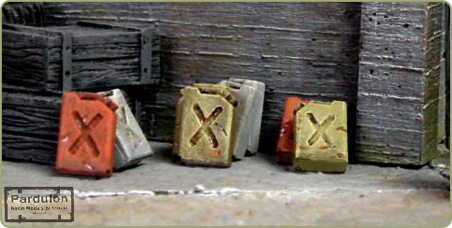 Pardulon has new Scrap Walls terrain pieces available over in their webshop. Various pieces of scrap metal, pipes and other disused items stacked head high. Perfectly suitable for any post-apocalpytic and quite a lot of modern settings. The scrap walls are either available individually, or as part of the new Salvager Outpost set. Pardulon helps accentuate your terrain pieces with their new Empty Baskets. We have just released a set of individual baskets which can be used for market stalls of almost any period, from ancient to medieval, or even modern rural settings. Pardulon helps accentuate your terrain projects with some more interior sets: Pipes and Switches. We have just released two interior detail sets: pipes and switch boxes. Both sets can be used to decorate the interior (or exterior, depending on the neighbourhood) of residential buildings. They might also come in handy in industrial settings. Pardulon Models has some new accent pieces for you terrain-makers with some new interior doors and worn-out mattresses. We've just released a few things from our current project. The doors are perfectly suited for most modern settings, while the mattresses will add a hint of coziness to otherwise bleak and dreary surroundings. 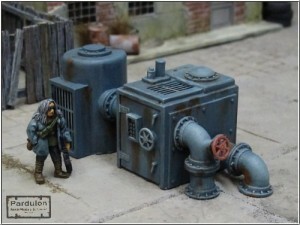 Pardulon pretties up your table with some new 28mm Industrial Terrain available on their website. We have just released two more modular industrial kits: pump and pump station. 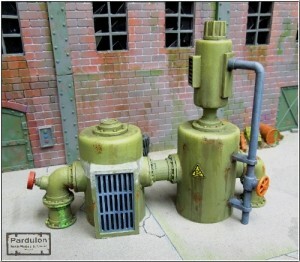 Both kits contain the pump house and a number of accessories which can be spread freely around the model to create unique industrial machinery. Both kits can be of course combined with the other models from the industrial range to create even larger machinery complexes. 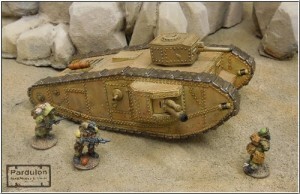 Pardulon Models has released a new 28mm heavy tank. Harrison Ford and Sean Connery models sold elsewhere and separately. Armed with one cannon in the turret, two in the sponsons and two machine guns, this beast truly dominates its chosen ground of battle. The kit includes four pairs of different cannons, so they can be used either as main armament in the turret, or as sponson guns. Pardulon has some new windows available for shedding some light into your mini buildings. We have just released a couple of window sets, suitable for civil building projects as well as large industrial complexes. 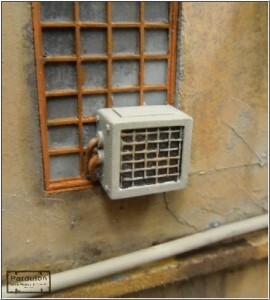 Pardulon helps your minis keep cool in their bunkers with their new window AC unit building accessories. These are commonly seen on the outside of buildings in climates where simply opening a window is not sufficient (or not an option). 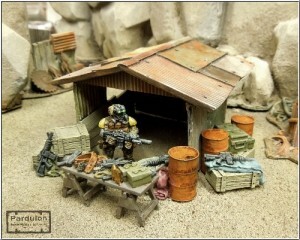 Pardulon Models gives your tables some more detail with the release of their new Post-Apoc Arms Dealer terrain pieces. Every post-apocalyptic settlements needs an Arms Dealer, catering to the needs of daily life in radioactive wastelands, deserted cities, or derelict industrial areas. 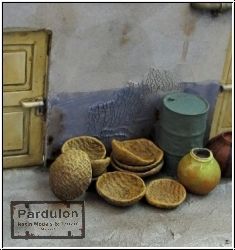 Pardulon Models has new scratchbuilding detail pieces to help ornament your modeling projects. We have just added a new category to our shop: Scratchbuilding! For starters, there are two sets of girders, as well as two sets of newly released handwheels. In the future, this category will contain more items that are no standalone models, but are valuable additions to scratchbuilding projects. Primarily aimed at 28 mm scale, these items might be used for other scales as well, depending on the intended use. Pardulon has some new modular tanks (the terrain variety) available up on their website. Decorate your battlefield. Stop using your little sister's stuffed animals for terrain. We've just released a 28 mm processing plant, as well as 2 chemical tanks made up from the same modular parts. 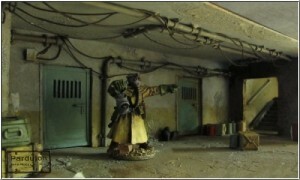 Pardulon Models knows your mini-soldiers want to keep what's outside out and what's inside in, especially when it comes to explosions, so they've got new blast walls available on their website. A set of four 28 mm concrete blast walls has just been released. 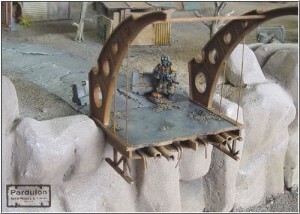 Pardulon Models has some new billboard terrain pieces available on their website. We have just released a 28 mm billboard, perfect for either urban or rural settings. Billboards such as this provide ambience as well as cover, even for larger things such as tanks or other vehicles. Pardulon Models has a pair of new offerings for us, their new bulkhead and alien plants. A set of alien plants and a bulkhead have just been released. 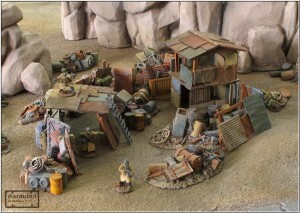 Pardulon helps bring a "Mad Max" feel to your table with their new Shanties terrain pieces. We've just released two more kits for our 28 mm Shanties range, introducing a new roof option for a greater variety, and some new walls to allow for watchtower-type buildings. 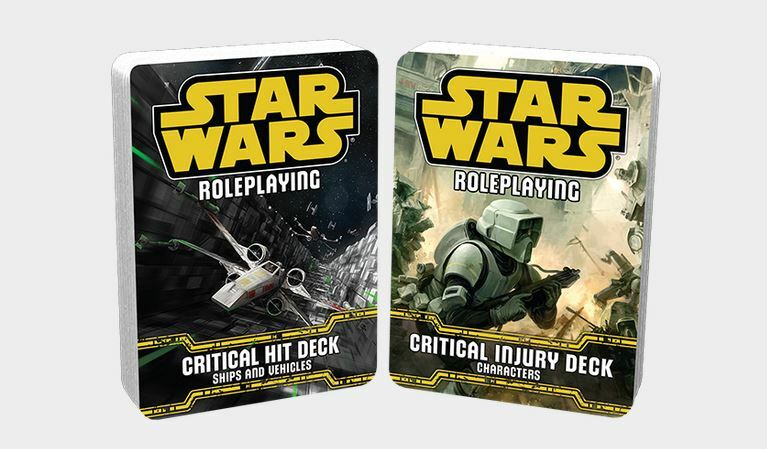 Pardulon has two new resin terrain pieces to spice up your sci-fi table. We've just added two freight containers for near future or sci-fi games. 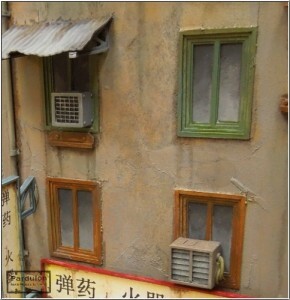 Pardulon Models have new post-apocalyptic buildings. 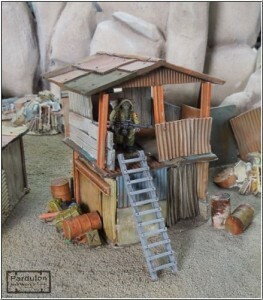 We have just added two more buildings to our new line of post-apocalyptic shanties. The shacks are highly modular and can be assembled in a variety of combinations. 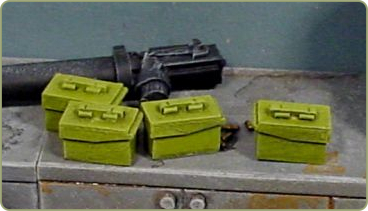 Set of eight small ammo boxes. Come unpainted and without miniatures and other items. And some more small stuff: a set of jerrycans and a set of larger wheels, suitable for large trucks or tracked AFVs.